"We don't do miracles here. Only magic." 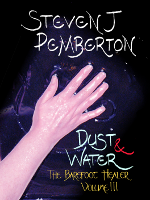 The novels of The Barefoot Healer are Death & Magic, Plague & Poison, Dust & Water, and Stone & Silence. The series is available as four individual books (ebook and paperback) and an omnibus (ebook only). The omnibus includes background material, a glossary, and a bonus short story, The Shortest Distance between Two Points. The first and second books are available in audio, read by me. The third and fourth will be available in audio as soon as I finish them. "The world and atmosphere that Steven has created is beyond words. Languages, races, villages, cities and characters all created into a world that is like no other." - 5 stars - Katie Turner, Turner's Antics. "A great read, and I'm looking forwards to more." - 5 stars - Rachel Cotterill. "Don't expect magical or cute... definitely a cut above the usual offerings in the ebook world." - Gordon A Long. "The subtle foreshadows and detail are what makes this story. Every other chapter I was second guessing myself and accusing a different character based on the evidence in front of me." - Callie Maher. Find The Barefoot Healer on Amazon US, Amazon UK, Audible US (audio only), Audible UK (audio only), Barnes & Noble, CreateSpace (paperback only), Google Play, iTunes, Kobo Books, Lulu (paperback only) and Smashwords. Or keep reading for more information about the individual books. The ISBN for the ePub version of the omnibus is 978 131 052 6534, which may help you to find it on retailers I haven't listed above. The Kindle (mobi) version of the omnibus doesn't have an ISBN. 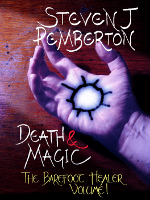 Death & Magic is a murder mystery set in a school for wizards. 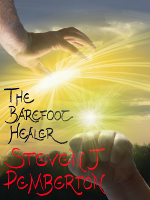 It's the first volume of The Barefoot Healer series, but is largely self-contained. When apprentice wizard Adramal moves to a new school to complete her training, she discovers that several ritual murders have been committed by magic, threatening the fabric of the world. The evidence points to the killer being one of Adramal's teachers, and the City Watch recruit her to go undercover to unmask the murderer. Can she find what she needs before the killer strikes again or - worse - without blowing her cover and putting her own life in danger? ISBNs: ePub 978 146 586 8039, paperback (6" x 9") 978 149 034 5840. The Kindle (mobi) and A5 paperback editions don't have ISBNs. 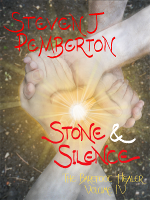 You can read a sample of the Kindle edition in your browser and buy it from the same window. Or you can read the first eight chapters on this page on my site. You can listen to a preview of the audiobook (5 minutes from the end of chapter 8, relatively spoiler-free). Take this quiz on Goodreads for a chance to win a copy of the ebook. The answers are all in the first chapter of the free sample. Here you'll find bonus material for Death & Magic, including a map of the school and Adramal's timetable. ISBNs: ePub 978 146 587 7659, paperback (6" x 9") 978 149 446 2994. The Kindle (mobi) and A5 paperback editions don't have ISBNs. You can read a sample of the Kindle edition in your browser, or read the first ten chapters on this page on my site. You can listen to a sample of the audiobook (4 minutes from the end of chapter 7, spoiler-free). Take this quiz on Goodreads for a chance to win a copy of the ebook. The answers are all in the first chapter. Here is the bonus material for volume II, including maps and behind-the-scenes photos. Somewhere beneath the teeming streets of the city of Molkolin lies a legendary well that reveals the true purpose of anyone who drinks from it. Adramal and her father believe it holds a secret that will help them defeat the evil God, Zorian. Click here to read the prologue and chapters 1 to 9. ISBNs: ePub 978 130 107 7274, paperback (6" x 9") 978 149 470 4971. The Kindle (mobi) and A5 paperback editions don't have ISBNs. 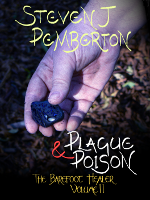 You can read the sample of the Kindle edition in your browser, or read the prologue and chapters 1 to 9 on my site. Take this quiz on Goodreads for a chance to win an electronic copy of the book. The answers are all in the prologue. Here is the bonus material for volume III, including maps, a deleted scene, and behind-the-scenes photos. The epic finale to the series. Captain Tagahra of the Kyer Altamar Watch has a lot of missing people to find. He doesn't expect one of them to be a wizard who's escaped from the city's prison, leaving a dead priest in his place. He learns the disappearances might be part of a plan by the evil God Zorian to take control of the city, and his orders are to help with the defences. But how do you defend against something you don't believe in? The wizard Adramal is racing home to Kyer Altamar to fight Zorian. She drank from a magical well and received a vision that claims to reveal her purpose in life. Clues in the vision suggest it may contain knowledge that will help in the battle... if she can crack its code in time. Meanwhile, Lelsarin, the immortal being who lives in Adramal's head, has her own ideas about how to deal with Zorian, and keeping those around her alive doesn't seem to be a priority. How far is she willing to go to rid the world of one God? ISBNs: ePub 978 131 135 4785, paperback (6" x 9") 978 153 096 4994, paperback (A5) 978 132 662 3234. The Kindle (mobi) edition doesn't have an ISBN. You can read the first ten chapters on my site. You can listen to a sample of the audiobook (two and a half minutes from the end of chapter 5). This has a minor spoiler for the end of Dust & Water. Here is the bonus material for volume IV, including maps and deleted scenes.